After the DirecTV merger, the AT&T Buy Flow business line needed to integrate DirecTV product offerings and content into the established AT&T online shopping experiences. 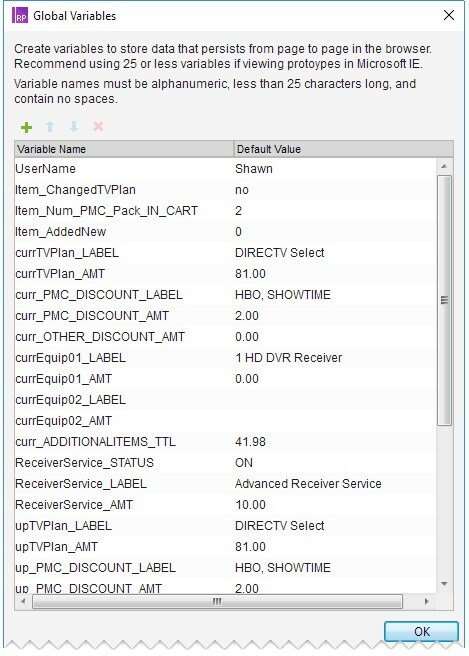 A basic Axure prototype of the AT&T shopping cart had been created to support previous project efforts but would not suffice for the DirecTV content integration project. The basic prototype was too linear; requiring test moderators to guide the user during the test and would not satisfy the goals of the Formative user evaluation test. A dynamic prototype would be a better test aid for this important test effort. A more real-to-life prototype would allow test subjects to click around the interface freely (“cognitive walkthrough”) while also allowing the test moderator to focus on collecting relevant user feedback. To accomplish a more dynamic, free-choice prototype, I leveraged Axure RP’s full range of Object Oriented Programming (OOP) and interactive capabilities. Exact persona details, testing methods and test results are a matter of intellectual property. However, the information below is indicative of the types of questions, data and results that were used to make informed design decisions. Affinity: He watches local television and sports channels in his spare time; especially to wind down in the evening after a long night at work. Technical Saavy: He has grown comfortable using DirecTV portals before the merger. He knew where to find bits of information and was able to manage his account fluidly and without much friction. Attribute: Anxious that the merger will force change on his account, pricing and product features. Attribute: Doesn’t want to go through the hassle of switching carriers but already looking around; assuming a worse case scenario. Attribute: He is considering buying his first home this year and is serious about penny pinching; bundling services is a topic he will consider. What complications will former DirecTV users encounter when adapting to the new AT&T shopping cart? AT&T and DirecTV have merged. You are still subscribed to the DirecTV Select plan. You are interested in changing your TV plan so you get more channels. You are also interested in maximizing the discount opportunity associated with the Watch More, Save More discount offer. Make whatever changes necessary to your account that allows you to take full advantage of the Watch More, Save More discount offer. However, once found, users quickly identified and understood the various TV plan product tiles. Most users were unable to track and understand all of the triggered interactions that occur automatically after choosing a new TV plan. Many users thought they needed to click the Continue button in order to address Task 2 objective; they did not notice the tabbed content option Channel Add-ons nor did they associate that language (Channel Add-ons) with the goals of Task 2. After completing both Tasks, and continuing, many users assumed the shopping cart total was the exact amount they would pay and were surprised to find a different amount on the confirmation page before completing/processing their order. Several users attempted to use the browser’s Back button in order to compare the line item details of the confirmation page against the shopping cart (sidebar). Increasing the number of choices a user can make will increase their decision time logarithmically. Users struggled to relate the Buy More, Save More (BMSM) options already associated with their account to the other remaining options available. 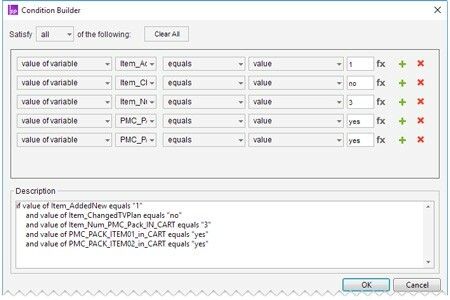 Similarly to Task 1, users were unable to track and comprehend all of the transactions that occurred after a selection; the yellow color background of new items added to the cart did not resonate with users. After completing both tasks, and continuing, many users assumed the shopping cart total was exact amount they would pay and were surprised to find a different amount on the confirmation page before completing/processing their order. Several users attempted to use the browser’s Back button in order to compare the line item details. ...of users tried to achieve the right outcome. ...noticed that the correct action was available to them. ...associated the correct action with the outcome they expected to achieve. ...saw progress made towards their intended outcome after choosing the correct action. This Formative user test relied on tracking the user’s ability to identify certain user interface options in order to accomplish each task. The test scenario required observing test subjects defined as “existing customers” and therefore the test began with the user in possession of certain product offerings already applied to their fictitious account. I used Axure RP’s Global Variables capability to establish the test subject’s predetermined account conditions and then listened for user event triggers during the test to update the interface according to conditional logic instructions. Mathematical expressions powering the dollar amounts in the cart pane were also manipulated dynamically. All transitions and interactions relevant to the test scenario mimicked the live AT&T site (at that time). Understanding the various content view states and the conditions that trigger their display was an important part of building the prototype. I inspected the live AT&T site constantly to ensure the prototype was a mirror image of the live experience. Total success! The prototype served its purpose perfectly for this formal Summative user test. Test moderators were allowed to focus on the user and the test objectives versus babysitting the prototype and guiding the test subject on where and what to click. Test subjects were able to click around a mock experience as if it were the live AT&T shopping cart and test metrics were collected with confidence. The greatest compliment came when I was asked to participate in the test itself. I was allowed to ask test candidates questions, monitor their behaviors and brainstorm the results; a true privilege. AT&T Inc. is a modern media company that brings together premium content, direct to consumer relationships, advertising technology and high-speed networks to deliver a unique customer experience (Glassdoor). This may be the best prototype we’ve ever seen here in the AT&T lab!